BLAEU, W. - Moluccae Insulae Celeberrimae. Moluccae Insulae Celeberrimae. 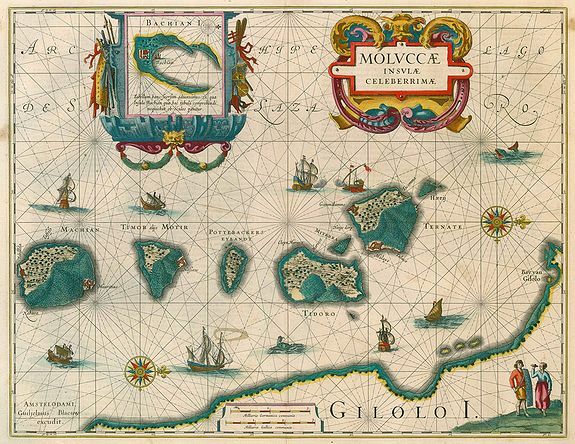 - BLAEU, W.
Title : Moluccae Insulae Celeberrimae.. Size : 14.6 x 19.0 inches. / 37.2 x 48.3 cm. Description :The map shows the islands of Ternate, Tidore, Mot and Makian. In the top right corner an inset map of the island of Bachian is shown. Latin text. Van der Krogt II, 8560:1. Condition : Good copy. Centerfold reinforced. Some spots in the white margin.